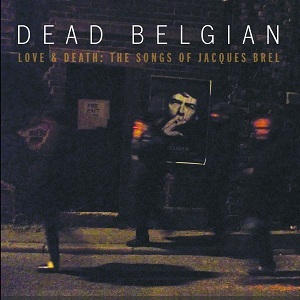 Dead Belgian are a band from Liverpool who play the songs of Jacques Brel. For most people in the UK, Jacques Brel is an unfamiliar name - he was best known in France and his home country of Belgium. Born in 1929, he was a Belgian singer and actor and died in 1978, and this is where the band take their name from - he's a Dead Belgian singer. Most of his songs were recorded in French, but his songs were translated and performed by performers including Ray Charles, John Denver, Frank Sinatra, Nina Simone, Andy Williams and more. With artists of that calibre performing his songs you get the idea that he's obviously a very talented songwriter. The four members of the band each rought their own influences to the band, from European folk to prog rock. Rather than simply play the songs exactly as originally recorded they chose to interpret them in their own way, stripping the songs back to the bones and adding to them. With instruments consisting of a ramshackle drum kit, ukulele, guitar, accordion, saxophone, mandolin, clarinet and flute, they've created a sound that works perfectly with Brel's songs. The accordion certainly makes sure the music keeps that Freench/Belgian feel to it. I can't comment how these versions compare to the originals but I can say they sound great here. Some of them are slow and soulful (Jaures), others have a great quirky fun feel to them (Madeleine), and others have their own feel - there's plenty of variety here while still keeping a common feel to the songs. Amsterdam is probably my favourite track - largely down to the lyrics which are in English (one of several songs on the album to be sung in English). It's definitely an unusual album that in some ways has a very dated feel - you can imagine some of the songs being used in a 1960's film set in Paris for instance, but at the same time they've been done in a modern feeling way, and as a result some certainly don't feel dated even if they have a sound that you don't hear these days. This isn't an album I'd have normally have thought of to listen to, but on listening I've been very pleasantly surprised - the songs themselves are great and wll written, and have been performed excellently. It's an unusual album but a good one - if the aim of the band is to bring the work of Jacques Brel to the attention of modern audiences then they're certainly doing a great job and I'm sure this will certainly gain a load of fans both for Jacques Brel and for Dead Belgian. "Love and Death: The Songs of Jacques Brel" is out on 2nd July via Limefield records.